Rapid Designs is innovatively establishing new levels of achievement in rapid manufacturing, producing finished parts for highly-specialized applications direct from 3D CAD digital input, thus dispensing with the costly and time-consuming process of tool making. Utilizing recently-developed materials with superior functional characteristics, Rapid Designs engineers apply their mastery of the selective laser sintering process to achieve new plateaus in quality and durability. Parts from rapid manufacturing meet exceedingly demanding specifications in defense-aerospace hardware, homeland security and medical applications. Eliminating the costly and time-consuming process of tool making by producing parts direct from computer-generated 3D CAD solid models. Users add significant speed and flexibility to their production operations with free form fabrication applying additive manufacturing processes. Designers are freed from traditional manufacturing processes allowing them to create with less restrictions. Finished systems can be completed and deployed faster. Design changes can be implemented with total flexibility at any time, with no wasted inventory of obsolete parts and no lag time for expensive and time-consuming tool changes. Rapid Designs, with its long history of providing models, prototypes and tooling for major systems applications, is ideally positioned for leadership in the rapidly-emerging field of rapid manufacturing. In particular, we are among the foremost experts in the application of selective laser sintering, which is presently the preferred process for rapid manufacturing parts. A few Rapid Manufacturing (RM) case studies have been documented since the late 90’s when this break-through in rapid manufacturing first appeared. Beginning with Siemen’s and Phonak’s success in the rapid manufacture SLS hearing aids, these two companies collaborated to develop the SLS process and materials to be the first commercial example of rapid manufacturing on a production scale. Invisalign made headlines using the SLA technology to rapidly manufacturing vacuum form molds for their patented process of teeth alignment therapy. Boeing implemented on-demand rapid manufacturing for the production of non-flight critical hardware on military aircraft. 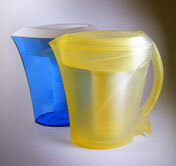 Rapid Designs has done several engineered Rapid Manufacturing Solutions (eRMS™) for customers. Programs have been fielded for military application using our engineered suite of proprietary processes. eRMS™ processes have been applied to U.S. Navy and U.S. Army hardware for UAV (un-manned air vehicle) and UUV (un-manned undersea vehicle) systems. These rapid manufacturing projects are in addition to hundreds of rapid prototypes for programs under development by our customers. Rapid manufacturing applications continue to be researched and developed for healthcare and soft tissue organs using bio-modeling technology. Advancements into this exciting rapid manufacturing technology are being fueled by new materials research and development. Implementation of production quality management systems was initiated in 1999 to meet the growing and changing manufacturing requirements of our clients. A cornerstone to Rapid Designs quality success is the standardization and implementation of materials and process quality assurance at every step of the manufacturing process. Testing by Rapid Designs is performed routinely to insure consistency from build to build, day after day. Our operations run 24/7 to meet on-demand customer production needs. Material certifications and certificates of compliance (COC) are included as standard operating procedure (SOP). Inspection is available at four levels with Level 4 provided as SOP for every order processed. Testing of raw materials and tensile testing on build coupons is performed to measure quality consistency of our end product. Our inspection and metrology lab includes: Instrom tensile testing, coordinate measuring machine (CMM), optical microscope, optical comparator, melt-flow test equipment and a vast array of instruments and test gages. All are tested, calibrated and re-certified annually. As early adopters of new technology, rapid manufacturing has emboldened Rapid Designs to research new materials and enhance material property characteristics. Break-through improvements are being achieved through our internal R&D initiatives, collaboration with customers, universities and suppliers. The benefits of laser sintered parts are numerous compared to other RP technology. Solid free form technology affords design freedom and tool-less manufacturing. New innovative “bound-less” design thinking in collaboration with new materials is shifting the manufacturing paradigm. Our rapid manufacturing output features landmark achievements in materials capable of withstanding the demands of high temperature and corrosive environments. The superiority of Rapid Designs rapid manufacturing expertise is evidenced in the recent achievement of meeting the stringent demands of flight-qualified hardware. 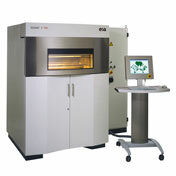 Selective laser sintering is a revolutionary layering process, in which powdered materials are applied, bonding layer upon layer, using computer-guided lasers to produce the precise configurations defined by the 3D model. Key systems components that have been successfully generated by selective laser sintering include a broad array of direct manufactured components, including undersea sonar array fairings, unmanned aircraft systems hardware and metal investment castings rapidly produced using SLS patterns. Quality control of all Rapid Designs rapid manufacturing output includes dimensional inspection and materials testing at the production site. The geometry of every part is precisely measured and compared directly to the CAD model. Materials are tested at each phase beginning with incoming materials. All incoming materials are traceable with supplier lot numbers. Materials are tested and characterized using a proprietary process before each build to insure the polyamide powder blend and performance is consistent with each build. Glass-filled polyamide is custom blended in-house to our exact requirements. Every part shipped is inspected to Rapid Designs minimum standard Level 4 inspection procedure. Material certifications and Certificates of Compliance (COC) are available upon request and in many instances are automatic depending upon application and industry. Rapid manufacturing projects generally begin with a consultation, in which engineers confer over specifications and required outcomes to confirm feasibility. 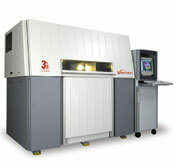 Then, customers electronically convey computer-generated 3D CAD solid models to Rapid Designs team of specialists, who integrate the input onto the selective laser sintering platform. To discuss your Rapid Manufacturing needs or to request a quotation, please contact Rapid Designs. The possibilities are endless – the future is absolutely unimaginable for the many. For the few the future of Rapid Manufacturing is now!